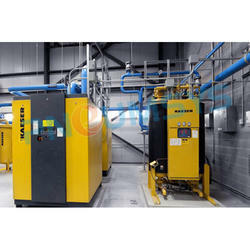 Our expertise provides Air Compressor for Robust and clean-running for sensitive processes. Whether for the semiconductor, food or automotive industries: our two-stage, oil-free compression rotary screw compressors tirelessly prove that process-sure purity and efficiency do indeed go hand in hand – even in extreme conditions. Uncompromising efficiency – Efficient compression with "Ultra coat"
Have special requirements? With their variable interfaces, our compressors are easily integrated into existing compressed air and control systems. Our experts will propose a solution that is specifically tailored to meet your exact needs – just contact us! Our expertise manufactured Reliably robust compressor which works even under extreme conditions. 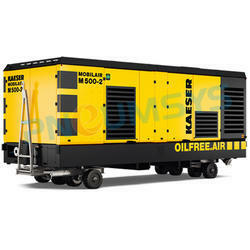 Kaesar Oil-free Rotary Screw Air Compressor with air-cooling work exceptionally well in the air-cooled infrastructure by ensuring compressed air supply reliability – even in ambient 45 °C temperature. There’s also plenty of power: innovative and intelligent system design, air-cooled oil-free compression rotary screw compressors are available up to 355 kW. Thanks to radial fans with high residual thrust, the heated cooling air can usually be used straight away for interior heating without additional auxiliary fans. In standby mode, the temperature-controlled Kaeser standstill fan reliably dissipates residual heat – which means the main fan can be switched off! The first and second stages of the aluminum block heat exchanger can simply be pivoted out for cleaning. KAESER Portable Oil-free Rotary Screw Air Compressor with air-cooling - The new standard for the 50 cubic meter class. Flagship M500-2 of KAESER combines the advantages of a two-stage dry-running oil-free rotary screw compressor with those of a mobile unit: maximum compressed air capacity and quality with unrivalled flexibility. Refinery equipment as standard – including certified spark arrestor, engine shut-off valve and sealed floor pan. Many features to facilitate setup (chassis with parking brake, crane and rigging eyelets, forklift pockets). Industrial equipment with high compressed air requirements has been fulfilled by ensuring the continuity of compressed air supply even during maintenance or renovation work. Other areas of application include pipeline flushing , refineries etc. Kaeser Portable Oil-free Rotary Screw Air Compressor easily integrates into existing station as a perfect team player. The reliable and low-emissions integrated Caterpillar diesel engine complies with Stage IV European emissions standards thanks to its integrated soot particle filter. Thanks to an innovative coating that remains immune to temperatures up to 300 °C, the blasted and phosphate-treated rotors show no measurable wear even after years of use. Thanks to its generously sized fuel tank, the M500-2 can run for two entire sequential shifts and can even run continuously when connected to an external tank. KAESER Oil-free Rotary Screw Air Compressor with water-cooling is Compact Energy-Savers. KAESER Oil-free Rotary Screw Air Compressor with cooling solutions enable us to achieve lowest possible power consumption values. This, in combination with a Kaeser heat recovery system, also allows you to significantly reduce your heating costs. We'd be glad to help you with a solution that meets your exact needs. Compact design and type-dependant small exhaust air duct. The tube bundle of the two air/water heat exchangers consists of high-quality CuNi10Fe pipes with welded-on aluminum star profile for optimal heat conduction. With a Kaeser heat recovery system, up to 96% of compressor exhaust heat can be recycled – for example, to heat water to 90 °C. The air/water heat exchangers of the 1st and 2nd compression stages are housed in two separate enclosures, each with optimal accessibility thanks to large service doors.